This article is the fifth in a series of white papers, Understanding Biochar. Biochar is an amazing material and brings properties to soil that cannot be achieved with other traditional soil amendments. However, it is part of a dynamic living system and needs to perform in conjunction with the other soil constituents, the soil microbiology and, above all, the growing plants. This guidance is intended to describe how those synergistic relationships can best be established when adding biochar to an existing growing system. No matter how it is presented, adding biochar to an existing soil introduces “change” into the existing soil and any ongoing plant growth. 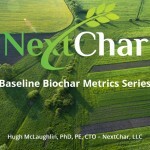 While the ultimate benefits of adding biochar will manifest over time, there are some practices that allow any drawbacks to be avoided and the benefits to be realized sooner. Unfortunately, much of the advice provided on the web is often wrong or misleading.